A friend of mine, who has knowledge on arms and ammunition, had once told me that each kalashnikov bullet costs four dollars. This he told me a decade before. The prices might have gone up now. Even if we ignore the cost of the guns, the cost of the bullets that are being used from training and drills to war and combing up operations alone cost thousands of dollars a day. Remember, bullets are the most cheapest ammunition available! Missiles, fighter jets, radars and other military hardware costs a lot more. There are several credible books available on how wars benefit companies. War is a profitable business. Most of the arms manufacturers are from the west. Sweden, termed a peaceful Scandinavian country, is one of the leading exporters of arms. Despite being produced in Europe, lion’s share of the weapons finally find its market in the troubled areas of Asia, Africa and Latin America. I always wonder why troubles brew in the above-mentioned areas only and not in Europe where procuring arms is much easy. The answer I got is that nobody would like to see their backyards burning. So, where do they sell the arms? In our country. Or countries like us. Recently, Israel secured a $2.5 billion missile deal from India. Now the firms involved or related ones would sell the missile defence hardware to pakistan. Then the news would be leaked to public through their own media. War mongering anchors would make a comparison between arms and ammunition stockpiles of both countries. People would go frenzy. Governments would happily initiate tender process. The arms companies would happily walk to the banks. We will get new toys to flaunt. Seeing this our ‘enemies’ would try to restore balance and go on spending spree. This is a vicious cycle! Only detriment to this cycle is peace, which these arms manufacturers would never allow to happen. During the time of LTTE, it was found that an Israel firm had supplied both the rebels and the Lankan governments arms simultaneously. The same happens now in syria. 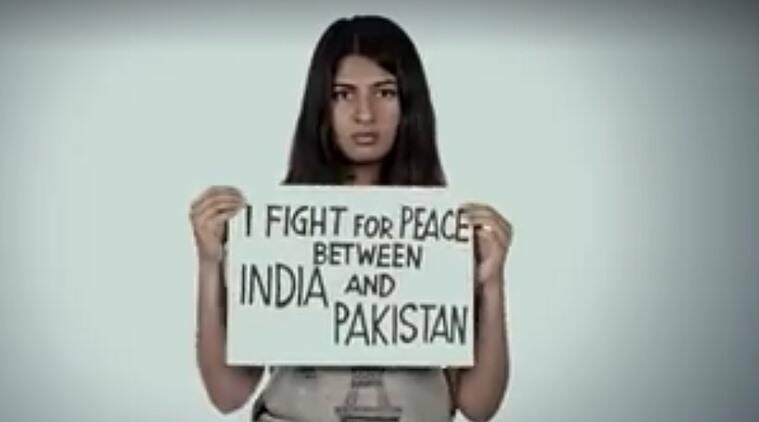 Gurmehar, being a sharp student, might have understood the working patterns of the war mongers. And she concluded that ultimate person/situation that got her father killed was war. Pakistanis were just pawns. Sometimes we also became pawns. Pak soldiers were also killed. In fact we didn’t kill them. War killed them. Sadly there is dearth of Gurmehars on both sides of the borders. What both the countries have in plenty is Sehwags and Hoodas, who are ludicrous enough to equate war with cricket, unmindful of the fact that the only relation the two have got is both were propogated by the west. It’s men of this standard who are knowingly or unknowingly helping political and religious bigots make ‘qabristan’ and ‘shamshaan’ in both the countries. PS: Gandhiji was not killed by Godse. It was a rabid ideology that killed him.